What is it? After the grape, citrus fruits, and the apple, the banana makes up the largest fruit crop in the world. Infants num-num on nanas, grannies munch on plantains, and busy people everywhere gobble up the grab-and-go fruit that comes wrapped in its own convenient, natural, and biodegradable packaging. Cultures have heralded the banana as a symbol of fertility or protective good fortune, but it is the banana's naturally sweet flavour and easy-to-eat texture that makes it a top nutritious treat all around the world. What is it good for? 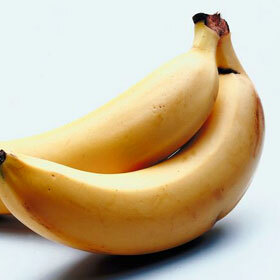 Eat one banana to meet about 35% of your daily needs of vitamin B6. Also known as pyridoxine, B6 supports healthy brain function, helps your body break down proteins from foods you eat, and boosts antibody production in your immune system. One banana would also provide nearly one-fifth of your daily needs for immune-supportive vitamin C. A couple of heart-healthy nutrients hide under that tough peel. In one banana, you'll get 10% of your daily fibre fill (fibre can help lower cholesterol and keep the digestive system healthy) and almost 15% of the potassium your body needs (potassium is needed to maintain healthy blood pressure and muscle function). Your digestive system loves bananas for other reasons, too, since some research has shown that substances in the fruit seem to shield the stomach lining from irritating acid and to help clear out bacteria that might cause ulcers. All that for only about 110 calories per banana! How to choose and store bananas: Buy them by the bunch (also called a "hand") or pluck one off at a time for a quick energy-boosting snack. Choose bananas that feel dense but not too hard, with bright, unblemished peels. If you grab green bananas, leave them to ripen at room temperature. Stash bananas in a paper bag to speed up ripening. Store ripe, unpeeled bananas in the refrigerator or freeze unpeeled bananas to keep for a couple of months. Frozen bananas are an easy addition to any healthy smoothie recipe or a less-healthy but undeniably delectable loaf of banana bread.